Astronauts Garrett Reisman and Stephen Bowen carried out an extended seven-hour 25-minute spacewalk Monday, moving a backup Ku-band antenna to the International Space Station along with an equipment mounting platform. They also loosened bolts holding six new solar array batteries to a cargo pallet as get-ahead work for two upcoming spacewalks. "The EVA was pretty much a raging success," said Lisa Shore, the lead spacewalk officer for Atlantis' mission at the Johnson Space Center. "We met every one of our major objectives. These EVAs were a challenge to train because we could not complete them end to end in (ground facilities). Until we actually performed them, we weren't sure how the timing was going to come out. And the crew just did a fantastic job." The spacewalkers had to contend with a space station computer glitch during the excursion, struggled with a balky electrical connector and were unable to completely tighten down the new dish antenna on its eight-foot-tall support mast. Engineers are considering whether the bolts in question should be re-tightened at some point down he road to close up a 1-millimeter gap in the dish-boom interface. Because the current configuration has never been analyzed in terms of its response to structural loads, the astronauts were told to re-engage the antenna's steering system launch locks and to tether the antenna to the truss as a safety precaution. Even so, mission managers said they considered the spacewalk and the progress of the Atlantis mission to this point to be an overall success. "We couldn't be more pleased with how the mission is going so far," said LeRoy Cain, chairman of NASA's Mission Management Team. "We've had a few glitches here and there, but they're not significant in the grand scheme of the kinds of things we're trying to accomplish on this docked mission." 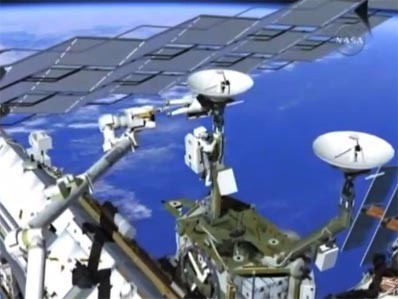 The computer glitch occurred as Reisman, anchored to the end of the station's robot arm, was in the process of getting the dish antenna from a cargo pallet before moving it up to the Z1 truss for installation. One of the station's three primary command-and-control computers, or C&C machines, dropped off line and handed operations over to a backup. That, in turn, shut down the station's video system and the lab's robot arm. The robot arm was re-enabled after a brief interruption and the spacewalk proceeded. Flight Director Emily Nelson said engineers believe the glitch may have been triggered when Bowen removed caps from electrical connectors in preparation for installation of the new Ku-band antenna. "When the cap was removed, what we suspect is that that broke continuity in one of our data buses and that confused our C&C, our command and control computer, such that it suspected a failure," she said. "And in case the failure is with that computer, it goes off line and allows its backup to come up. "All of the critical functions that that computer provides are handed over immediately to the backup machine. So we maintained communications via S-band, the (robot) arm safed itself because of that transition of its controller. But all of our other functions within the machine were handed over from one to the next." The space station currently is operating with two C&C machines, a primary and a backup, pending a review of telemetry to make sure the problem with C&C No. 3 is fully understood. Monday's spacewalk was the 144th devoted to station assembly and maintenance since construction began in 1998, the eighth so far this year and the first of three planned by the shuttle Atlantis' crew. Total EVA time now stands at 900 hours and 58 minutes, or 37.5 days. Bowen's EVA time through four spacewalks is 27 hours and 21 minutes while Reisman's total through two EVAs stands at 14 hours and 26 minutes.